KIEV, Ukraine -- Nationalist demonstrators in Ukraine on Saturday attacked two offices of Russian banks in the capital amid observances of the second anniversary of the protests that brought down the Russia-friendly president. An activist attacks an Alfa Bank office in Kiev on Saturday. 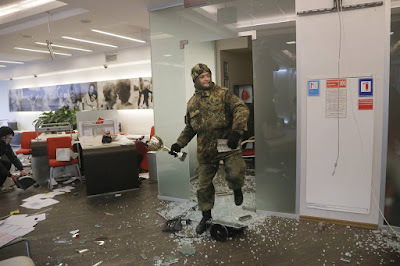 Demonstrators threw rocks through windows at the offices of Alfa Bank and Sberbank and damaged furniture and equipment inside. Protesters also vandalized the offices of the holding company of Ukraine’s richest man, Rinat Akhmetov. The term refers to those who died during the months of protests in Kiev that culminated with President Viktor Yanukovych fleeing. After the ousting of Yanukovych, Russia annexed the Crimean Peninsula from Ukraine and Russian-speaking separatists in the Donetsk and Luhansk regions launched protests that escalated into a war that has killed more than 9,200 people. A cease-fire was called a year ago, but reports of violations are frequent. Russia, which Ukraine and Western countries claim has sent troops and equipment to back the insurgents, blames the Kiev authorities for keeping tensions high by failing to push through measures that would increase autonomy for the eastern regions and allow local elections. But nationalists vehemently reject any concessions to the east and are angered by authorities’ failure to address Ukraine’s endemic corruption. Akhmetov, whose wealth springs from mining and steel in the east, is a target of their anger. In recent weeks, political tensions have risen and President Petro Poroshenko this week urged Prime Minister Arseniy Yatsenyuk, a key figure of the 2014 protests, to resign along with his government. But Yatsenyuk survived a parliamentary no-confidence vote.